Address by Ms Natalie Lobastov JP, former refugee from Russia, 2011 Refugee Conference, University of New South Wales, 15 June 2011. I was born in the city of Harbin, China, to Russian parents. Harbin, now capital of Heilongjiang province, to the North of China, was established and built by Russians. Back in 1896 Tsarist Russia and China had good neighbourly relationship and agreed to build the extension of Tran Siberian Railway, called Chinese Eastern Railway, mainly for trade purposes. 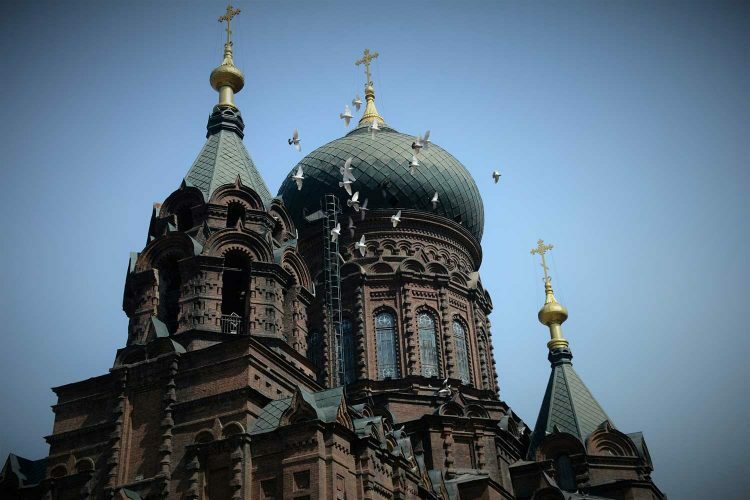 In Harbin there were Russian schools, theatres, Universities and 25 Russian Orthodox churches. So I was brought up on Russian culture and Orthodox faith. When China became communist Chinese Government told the foreigners that China is for Chinese so we had to flee. Russia was under communism, so we could not go to Russia. I was 12 months old when the soviet army entered China and took thousands mainly men to Concentration camps in Russia, including my father and uncles. My mother decided to apply for visa to Australia, as she knew a friend who could act as our sponsor. She had to provide Certificate for clean bill of Health and Chest X-rays – no tuberculoses. World Council of Churches came to our aid – they paid for our fare to Australia, which my mother repaid fully after working for a while. My mother’s life in Australia was difficult. Back in China she was teaching Russian at the University in Harbin. Arriving in Australia and not knowing English, with few services available in those days, she worked in factories, as a cleaner at the hospital … She was fairly depressed about her situation, but she was grateful that her children would have a brighter future. I arrived in Australia, Brisbane at the age of 12, not speaking a word of English. I was placed in Primary school. No support provided. I just sat there. Saturdays I went to Russian school. After a few weeks I left school and went to work in factory where they made hessian bags. Accepting me for work, they asked me one question – Can I count to 25? A few weeks later my Russian school teacher took me by the hand and said you will not work in a factory, you must go back to school. She enrolled me in a school in a different suburb, where a little more attention was given to me. I still have a book about an aboriginal boy, Booran, which I translated word for word into Russian. I started studying. I completed Russian school, then Cavendish Road High school and started my job as a bookkeeper. In 1968 I moved to Sydney, where I met my future husband, Alexander, also Russian from Harbin. After our marriage we lived with his parents and saved madly. Four years later we travelled around the world for 9 months. On our return we had 2 children. I brought them up bilingual. That was not easy in the 1970s. Policy of assimilation was strong. Even a teacher at my daughter’s primary school asked me once: What is more important to you, English or Russian? My response was – both. Two languages, 2 cultures, the person is that much richer. When the children became older I went back to part time office work, which I found very repetitive. Having the first hand knowledge of difficulties in a new country I enjoyed helping people. I sat for the exam and obtained my NAATI accreditation in Russian language. About the same time I was invited to participate in establishing of Russian Ethnic Community Council of NSW. I am Foundation member and still on the Board, 17 years. Realising how little I knew about government structures and welfare I went to TAFE to study Community Services (Welfare) cert 3 and 4. Later I worked for Ethnic Child Care Family and Community Services, arranging services for Russian elderly. I continued studies and graduated from Macquarie University with B.A. majoring in Russian. The same year my daughter Marina graduated from Sydney University. Now Marina works at Tasmanian University as manager of On Line learning services. This last week end she did a short exciting job as interpreter to Russian Hairdresser Extraordinaire, Gerorgi Kot at Hilton Keunae Hair Expo. I worked as volunteer interpreter at Sydney Olympic Games, 2000 together with my daughter. Great experience! So proud to be Australian. For the last 15 years I have been working as interpreter at Sydney West Area Health and Sydney South West Area Health and Centrelink. There is great job satisfaction in my work. For my community work in 1998 I was awarded a medal from Archbishop Hilarion of the Russian Orthodox Church Abroad. Last Year I was nominated for the Australian of the Year Award. In conclusion I would like to say that we are all very fortunate to live in such a wonderful country like Australia. I am a supporter of a multicultural organisation called Thank you Australia. Their motto is: There is a time for everything – there is a time to say thank you Australia.